1 Preheat oven to 425˚. 2 Blend Stock, Knorr® Sazon with Garlic, Onion, Annatto and Coriander, olive oil and rosemary in small bowl. Toss mixture with remaining ingredients in 13 x 9-inch shallow roasting pan or dish. 3 Roast uncovered 45 minutes. 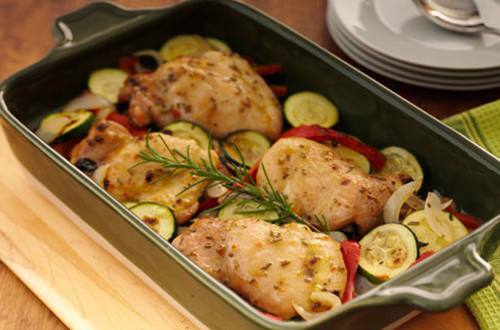 Remove chicken to serving platter, then top with vegetables and drizzle with juices.